Ergobaby Original baby carrier is one of the first models of carriers by ERGObaby. It is the most basic model out of the ERGO range. It has 3 carrier positions, its material is canvas cotton with soft cotton lining (the shell is also available in Linen for a more breathable option), it has padded shoulder straps and waist belt, convenient pocket at the front that can be zipped up, hood for rain and for napping. Without the insert carrier can be used by babies when they reach 12 LBS and have good head control, or it can be used starting at 7 LBS with the insert that you need to purchase separately. The manufacturer claims that it can be used up to 45 LBS which is according to Babycenter.com growth chart is approximately 5-6 years old. The carrier is solid so you will be able to use it for all your kids. Unlike Beco Gemini we did not come across people who reported that the carrier tore up when used within the recommended weight range. The carrier is 100% ergonomic and is comfortable for both parents and babies. It has two downfalls: ‘front carry facing out’ position is not available for the Original model and you need to buy a special insert for the infant separately. 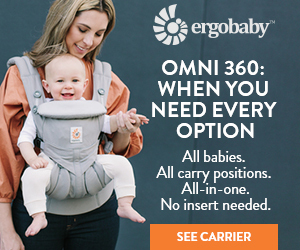 Those of you who want to go with the ERGO carrier and would like to do the facing out carry position and not use separate insert for your newborn will be happy to know that ERGO has four position 360 which is very much like the original but has the option of using it in front carry facing out position ergonomically as well as adapt for newborn babies without the insert. But right now, let’s take a closer look at the good old ERGObaby Original carrier. Watch this video for a more hands-on demonstration of Ergobaby Original carrier and all three positions with the real baby. The carrier material is 100% cotton and breathable. The exterior is canvas and is definitely very secure. There are no concerns of it tearing up as with Beco. The carrier is not padded. The only padded parts are the ones that parent wears: shoulder straps and waist belt. The lining is soft cotton for sensitive baby skin. Stitching is very secure and durable and is reinforced at the intersections. A lot of parents mention that the carrier has good quality buckles that feel very sturdy. Every Ergo is equipped with a hood which is very useful for rainy/windy weather and for napping on the go. The carrier has a front zip-up pocket that all babywearers just LOVE. No wonder, when you are wearing your baby you don’t exactly want to carry your purse along. ERGObaby Original baby carrier is meant for babies starting at 12 LBS. But ERGO has thoughtfully come up with the insert for newborn babies. With the insert you will be able to carry an infant starting at 7 LBS. The insert is safe for the infant, although there are plenty of downsides and many babywearers agree that ERGObaby Original is more suitable for babies starting at 6 months as it can be a little tricky to put on and feels hot for the baby. The insert is 100% Cotton and is machine washable. It has a removable pillow, neck cushion, padded back for extra support and straps which you can attach to the carrier to make it more secure. Here is what parents say about the insert. Please do keep in mind that Ergo has plenty of amazing reviews. Here though we try to show you some things that parents don’t like so you can make a well informed decision. Our newborns have found the insert comfortable enough to fall right to sleep when we carry them in the Ergo. However, it makes it very warm in there so I’ve rated it lower because you can’t use this in warm weather. You get hot sweaty babies that wake up unhappy after a little while. It is frustrating using the newborn insert, it takes two of us to set it up by which time bub is screaming her head off 🙁 Got sick of it so it sits in the cupboard and have only used it once. The belt around waist is not the most comfortable either especially after having a caesarian! In this video one mom shows an alternative way of putting on the Ergobaby Original carrier infant insert. It is different from what the manufacturer recommends but she figured this way out from personal experience of using Ergobaby Original Carrier for her newborn babies. Perhaps you will find it useful. ERGObaby Original has three carry positions. Front-carry facing-in position is the most popular one. It holds baby in an ergonomically correct frog-leg position. Thanks to the hood that ERGObaby carrier has, your baby can take a nap. – The clip at the back (behind shoulders) is a little tricky to do up and takes a bit to get used to. The only thing I would advise is to remember to adjust the back/chest strap up higher before you wear it otherwise it is really awkward to try and put your hands over your shoulders to secure it in the default position. I don’t know if my hands are short or if I am not very flexible but I am having hard time reaching out for that back buckle. I mean I can do it, but it’s not an easy task as it looks on those demo videos that they show. So before putting on the carrier remember to always adjust the back buckle by moving it higher or lower..
You have an option of carrying your bub on your side (on your hip) between 6 to 24 months. Your baby should have full head control when you use this position. We like this position as it let’s you two see each other, while at the same time allowing your baby for an all-around view of the surroundings. Many wearers don’t use this position as it takes a lot of adjustments and manipulations, but those who try it seem to enjoy the position. As with everything else when it comes to babywearing: after some practice you get so good at it, you don’t even think about it. Practice switching at home so you can easily do it once you are out and about. Back Carry position is amazing when your baby gets a little older. We feel that it is best to wait past one year before you use this carry position. But if you feel that your little one is ready earlier, the manufacturer recommended age for back carry position is 6 months. Another thing that some parents don’t like about the ERGO carrier is the fact that it has a very short body. So for some children the carrier cannot be used till its indicated age range, children outgrow it much sooner. The only fault is that the back is not very high so as I had larger children it did not get as much use as some of the other buckle carriers offer. ERGObaby carrier provides ergonomically correct frog-leg position for the baby. The seat is wide and comfortable and the baby is well-supported. The material and buckles are very secure and good quality. The stitching on the carrier is reinforced on the intersections and is not likely to tear. We definitely feel that ERGObaby carrier is safe for the baby. The major complaint that parents have when it comes to security is that the body of the carrier is short and many parents with tall and bigger babies don’t feel that baby sits securely enough in the carrier and have to support baby’s head (you don’t always want to put the hood on the baby). ERGObaby carrier proved to be very comfortable for both parent and baby. 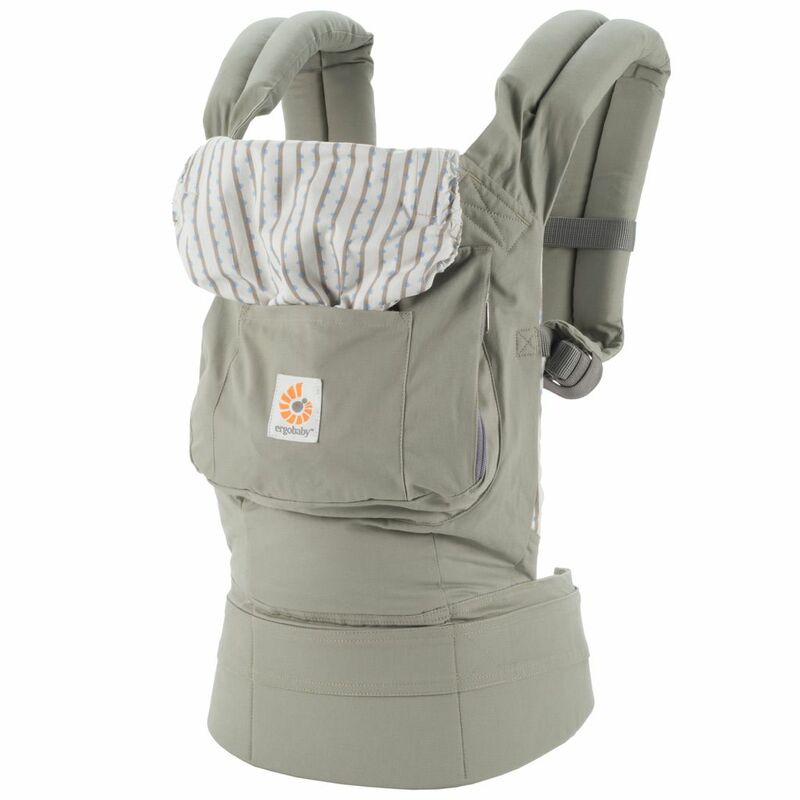 Carrier has a wide padded adjustable belt and wide padded shoulder straps. It can fit person of any build and does not give any discomfort even when used for couple of hours. As the baby’s weight is evenly distributed thanks to the waist belt, Ergo will not give you backache unlike Baby Bjorn. Many parents reported wearing it for a long time without any body aches. My newborn would not sleep very well in her bassinet or baby swing, but in the Ergobaby she would happily sleep for hours. This carrier has been an absolute lifesaver as I have still been able to play with my toddler and do housework whilst wearing it. 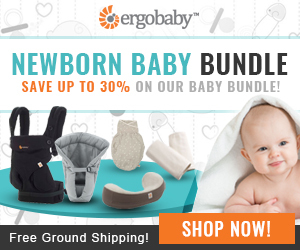 Unlike other carriers, the Ergobaby doesn’t give you a sore back, shoulders or neck. All the weight of the baby is taken through your hips. My baby is now 3 months old and I still use the Ergobaby on a daily basis. Parents appreciate convenient storage pocket in the front of the carrier. Some parents feel that it is hard to put on as they struggle with the back buckle. But most say that you get used to it and eventually learn to buckle it without any issues. Another complicated part is putting a newborn baby into the carrier with the insert. And just like with the back buckle, some manage to master it and just love wearing their newborn in the insert, but some on the other hand never manage to put it on without someone else’s help and end up waiting to use the Ergo when their baby no longer needs the insert. We got the Ergo with the infant carrier so it can be used from birth up to 3yrs. It’s strong, sturdy and supportive and the baby loves being in it so it must be comfortable too! It takes a few goes to get the hang of putting it on – especially by yourself – but once you’ve got it sorted, it’s so much quicker and easier than a pushchair. Ergo is very comfortable for the baby. It is breathable and has soft lining for baby’s sensitive skin. Most babies fall asleep in the carrier quite easily and can spend a long time in the Ergo without any complaints of it being uncomfortable. Their back is well supported and the hood provides much needed comfort if they want to nap. However those living in hotter climate report that they could not use the Ergo for too long outdoors as the babies got too hot, especially when used with the insert. There is one minus that I would like to point out. During summer we went to visit family in Florida. It got really hot in Ergo carrier. Something to think about if you live in a hot climate area. Ergobaby carrier is machine washable. Just pop it into washing machine on cold wash cycle. You can dry it in the dryer on delicate cycle, but do not overdry: manufacturer recommends removing it when the seams are still damp. But we would recommend air drying it. Just air dry overnight, in the morning it will be good as new. Washing does not do any harm to this carrier, it will be looking great even after years of use. I am using it for my second daughter now and it still looks as new as when I bought it. The construction is solid but not ov erly heavy; its easy to clean and stuff under the buggy for when bubs has had enough and wants to be carried. While I wouldn’t recommend wearing it for hours and hours at a time, it has proved to be more comfortable than any other I have tried and I recommend this to all new parents. They are pricey so if you know a friend who has one then try it out first; if you want an investment you can use for years (turns into backpack) then I recommend an Ergo. The carrier can be used starting at 12 LBS or when your baby has good head and neck control and can be seated in a frog-leg position in the carrier which is usually around 4-5 months for most babies. With the infant insert which needs to be bought separately you can start using it when your baby weighs 7 LBS which is from birth in most cases. Around the age of 6 months you can start carrying your baby on the back and on the hip. Although we are advocates of not using the back carry position for babies younger than 12 months. Usually you will be able to front and hip carry till the baby is around 24 months (although all babies develop differently and varies from baby to baby). With back carry position you will be able to use the Ergo till your baby is 45 LBS which is approximately 4-5 years old. The manufacturer recommends using the Ergo for as long as it fits and your baby is happy in it. Should I Buy the Ergobaby Carrier? Ergobaby is a versatile carrier. It has very good quality material and buckles therefore it is very secure and sturdy. However the body and the hood can get too short for taller babies. For the hood Ergo has found the solution: the hood extension. It is very comfortable for the parents with its padded waist belt and shoulder straps. It has a fantastic hood and front pocket. Most parents are able to put it on without any issues especially after some practice, however some have a hard time buckling the back buckle when in front carry position or putting it on when using it with the insert. It works for newborn babies with the insert which you will need to purchase separately. Some parents like using it for newborn some recommend waiting till the baby is around 4-5 months or 12 LBS and can be carried without the insert as they struggle to put it on. Plus baby gets way too hot in it. It has quite an extensive age range (up to 2 years for front carry and up to 4 or 45 LBS years old when back carry). Again, if your child does not get to like the back carry the age range becomes very limited. Although most kids quite enjoy it. The carrier is machine washable and can be dried on delicate setting in the dryer. We hope that this information will help you make a more informed decision whether the Ergobaby carrier is right for you and your baby. If you have an option of borrowing it even for a couple of hours from a friend or family member – it will be the best option. 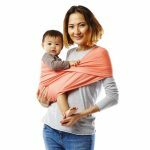 if you are shopping for the best baby carrier for your little one then you will probably consider Ergobaby Original as one of your options. It is one of the most popular baby carriers on the market with its extensive age range, ergonomic design and durability. It features three carry positions: facing-in, back and hip carry. It can be used when your baby gains full neck and head control or from birth with the insert. Read on for more details.